If you’ve been having trouble with your vehicle’s battery near Manhattan, Bronx, and Queens, it’s time to get it replaced. Car battery troubles aren’t something you can really put to the side or wait on. Without a working car battery, your vehicle will break down or simply not start until the part is replaced. Luckily, the BMW battery replacement process is quick and painless and can be done at your local BMW service center in just a few minutes if you schedule an appointment in advance. 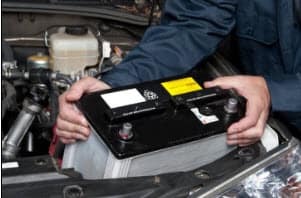 If you’re not sure whether your vehicle needs a battery replacement, it might be time to refresh yourself on what the signs are. To help you, we’ve put together a list of the most common signs of a necessary battery replacement. Check it out now and, if necessary, schedule a service appointment at your local BMW service center. Check engine light is illuminated: If the check engine light comes on, it could be a sign that your car battery is dying or low. Battery is old: If your car battery is older than three years, it may be time to replace it. While this timeline isn’t true for all battery brands, it holds true for many. So get the condition checked during your regular vehicle inspection to be sure it’s in good health. Corrosion on the battery terminals: If you pop the hood and see any kind of fluid, corrosion, or gunk on the battery terminals (where the cables connect), it’s time to replace the battery. These will need to be scrubbed before the new battery is put in to prevent damage. Car cranks for a long time before starting: If you hear the engine turn over several times when you’re trying to start the vehicle, the battery is probably dying. When you choose to bring your vehicle to the professionals at BMW of Manhattan for your next car battery replacement, you can feel confident that you’re going to get the high-quality work you’re looking for. Our team is highly trained to take care of all of your vehicle’s maintenance and service needs. When it’s time for you to schedule your vehicle’s battery replacement near Queens, Manhattan, and Bronx, choose the professionals at your local BMW service center. BMW of Manhattan is conveniently located at 555 West 57th Street in New York, NY. Our highly trained service professionals can take care of all of your vehicle’s maintenance and service needs, whether or not it’s a BMW vehicle. Our team will be happy to guide you through the entire battery replacement process and work with you to keep your vehicle running smoothly during our regular service center hours Monday through Thursday from 7:30 am until 7 pm, Friday from 7:30 am until 6 pm, and Saturday from 8 am until 5 pm. Schedule a service appointment online now for your BMW battery replacement at BMW of Manhattan.